DREAMY HEALTH: Can't lose weight? Don't blame your metabolism! Can't lose weight? Don't blame your metabolism! For those who struggle to lose weight, it has always made sense to blame a slow metabolism. In my work as a diet doctor and nutritionist, I hear this excuse all the time to explain away everything from middle-age spread to the fact that their best friend eats twice as much, but stays effortlessly slim. It's not that they are overeating, they insist, it's because their body doesn't burn up calories as efficiently. But what is the real truth about the link between your metabolic rate - that is, the amount of energy used up by your body just to keep your heart beating, your blood pumping and so on - and weight gain? Does a slow metabolism automatically mean you will end up overweight? To find out, I have tackled seven of the most common myths about metabolism. This is so widely believed and yet so very far from the truth. If you have a lower than average metabolism, you might need fewer calories than some others for your body to carry out all the basic functions. But we're only talking about the calorie equivalent of a small latte or a small piece of cheese on a cracker per day. It certainly doesn't explain why your friend seems to get away with eating a side order of chips when you can't. Her metabolism is not that much higher than yours. The real reason she doesn't put on weight and you do is simple. She almost certainly doesn't eat as much food as that at every meal. Most metabolism scientists agree these days that everyone who overeats will gain weight and so this super-skinny friend of yours will be cutting back on other meals and snacks to make up for the occasional indulgence. I have conducted food trials where we have enlisted 'naturally skinny' volunteers to increase their calorie intake and they really struggled to overeat at every meal. Left to their own devices, their instincts were to skip a meal or go light on supper to balance out their intake. This isn't exactly true either. It is certainly correct that resistance exercises such as free weights and gym machines build muscle, but muscle actually has quite a low metabolic rate and gaining a whole kilogram of muscle in the gym (which is a lot) would still add only ten calories - equivalent to half a teaspoon of sugar - to your metabolic rate, a day. We though we knew the answer to this about 20 years ago, but the researcher who drew this conclusion was subsequently prosecuted for fabricating his metabolism data and spent time in jail. What we do know is that the final phase of the menstrual cycle in young women increases metabolic rate by about 5 per cent, making them super-hungry, and often with cravings for high-calorie treats. So it's quite likely the hormonal changes brought on by the menopause reverses this monthly rise. But it accounts for only a relatively small drop in terms of the calories the body needs to function - equivalent to a typical biscuit, in fact, per day. 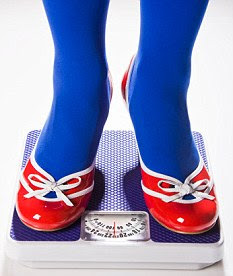 It is certainly true that men have a higher metabolism than women by about 300 calories a day. But while it used to be true that women gain more weight as they age, men have done a remarkable job catching up in recent years, so this higher metabolism doesn't automatically protect men against weight gain. Men need to keep an eye on calorie intake, too, if they want to stop piling on the pounds. There is a grain of truth here, but only a grain. When you cut calories to lose weight, your body does go into conservation mode, saving calories rather than using them. But this accounts for only about 30 per cent of the calorie reduction. For example, say you eat 1,000 calories a day, rather than the typical 1,940 consumed by a healthy woman. Your metabolism can be expected to slow by about 330 calories so you are still cutting out 670 calories, the equivalent to losing a pound a week rather than a pound-and-a-half. For dieters of all ages, plateaus are almost always caused by one of two other factors, to do with calorie intake, rather than usage. It's either down to a terrible diet which works by causing mostly water loss in the first few weeks, then falters once the excess water has gone, or it's because the dieter is inadvertently eating more calories than the diet intends. It's important to follow a diet that cuts hunger and keeps you satisfied. It also helps to write down everything you eat for a few days to see where the extra calories are creeping in. Although, in theory, it seems logical that a slow metabolism must be linked to weight gain and obesity, research evidence doesn't really support this belief. Yes, some people do have a lower metabolism than others and if your metabolism is low, your body needs fewer calories to maintain weight. But not that many fewer. It is really rare, in my experience of measuring metabolism in hundreds of men and women, to find somebody whose metabolism is more than 10 per cent higher or lower than average. In other words, a sluggish metabolism doesn't instantly mean a life sentence of obesity. It still all depends on your calorie intake. The only real explanation for weight gain is that you are eating the wrong food. You need to learn which foods will cut hunger, which foods will give you the vitamins and minerals you need, but on fewer calories. That is the key to weight loss and it's a path which will help even those with a low metabolism to lose weight and keep it off. Unfortunately, this is true and there's nothing much we can do about it. The average person's metabolic rate will slow by 1 or 2 per cent per decade of life, for reasons unknown but probably a combination of shrinking brain and organs, plus muscle loss. On top of that, most people are less active as they get older which means at 60 we really do have to eat 500-600 calories a day fewer than in our 20s - just to stay the same weight. However, our bodies need vitamins and minerals more than ever, so it's not just about consuming fewer calories but about cutting out junk.